This month’s T-SQL Tuesday is brought to us by Riley Major‏ (b | t) and he encourage us to talk about how we are helping by giving back to our community. This is the 102nd edition of TSQL2sDay – an Adam Machanic’s (b | t) brainchild. I have heard about SQL Server the first time back in 2003 when I was on the high school and I had a database class. Was a slow start and, at that moment I haven’t imagined that would follow that path professionally. At that time I didn’t even know that a community exists, but when I went to professional course (level IV – it’s a degree before bachelors) on 2006 that was based on Microsoft technologies, .NET (Web and Windows forms) and I had a database class using SQL Server 2000! That was when I started using more and more the internet for study, found some blogs posts and the SQLServerCentral. So I can say that I started consuming the knowledge from the community back on 2006. A year later I started my intership in what was my first IT job. At the time I needed to work with a bit of everything but more focused on SQL Server development. The guy that was on my place before I arrived took a manager position but he was a big lover of SQL Server and I learnt a LOT from him! 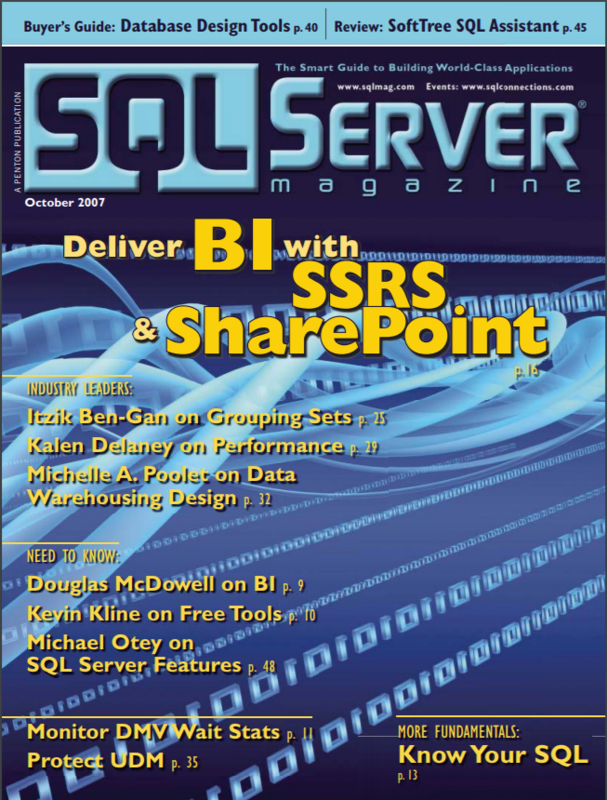 At the time he subscribed the SQLServer Magazine in paper! (later the name changed for SQLServer Pro). You can found the maganize archives in PDF format here. That was when I start knewing who people like Itzik Ben-Gan and Kalen Delaney were! During about five years I was a compulsive consumer of blog posts related with SQL Server development but most of the time was when I had a problem and wanted some guidance on the solution. During that time I haven’t shared too much knowledge on the internet. Then, 2012, I went to my first SQL Port user group meetings and my first ever SQL Saturday, 115 Portugal. Those were my first real contact with SQL Server community and where I met some speakers and started to join the montly meetings regulary. At 2015 I joined Twitter and decided that I wanted to share my knowledge even more. So after being approached several times I took courage and did my first public presentation for SQL Port user group in Lisbon and right after I submitted a session for SQL Saturday Oporto 2015 and I was accepted. You know, start small and grow…so I started talking in Portuguese for the user group and then went to SQL Saturday where I did the first public speech in English. Now, we were in 2016 and was the first edition of TugaIT (the CFS is open for this year – Summer Edition) and at that time I was “just” a volunteer but I had a gut feeling – I have discovered, few months earlier, that dbatools was a thing and decided to go and talk with the creator Chrissy LeMaire – I had written a couple of PowerShell scripts to help me and decided to ask her if she has the intention to extend the module to best practices and we talk for like 1 hour, exchange contacts and started talking furiously about dbatools and then…I was doing a PR with a full command (Expand-DbaTLogResponsibly) and this was the time I felt I was doing my first “more international” contribution to the community. Since then I have being more active on the community mainly with SQLServer and PowerShell stuff. Help organizing and also as volunteer on several user group meetings, SQL Saturday (Lisbon), TugaIT and also co-lead the Global Virtual Group Portuguese. Started this blog on September 2017 to write down some notes and, again, share with others. As you can see I didn’t born inside the comunity, I have grown because of it and decided to start giving back less then 3 years ago. Help me be a better professional? For sure, I have learned so much from many different sources and every day is a new learning day!